Patty Meads-Hanson’s New Book “Everyone Loves Blosom” is a Feel Good Children’s Book about Following Dreams and Never Giving Up. Recent release “Everyone Loves Blosom” from Page Publishing author Patty Meads-Hanson is a true story about the world’s tallest cow who has touched the lives of all that have met her. Patty Meads-Hanson, a new author and devoted animal lover has completed her new book “Everyone Loves Blosom”: a touching and cheerful story of following one’s dreams. Patty Meads-Hanson has always been a devoted animal lover. She has rescued countless unwanted animals and given them a second chance at life. They are all special and have their own story to tell. Patty’s menagerie includes ponies, two donkeys, cats, dogs, bunnies, birds, and her special friend, a cow named Blosom! She owns and operates Memory Lane Crafting Retreat. The retreat gives her the opportunity to share her farm and animals with others, many that have never been on a farm. The animals of Memory Lane add character and charm to the farm, and of course, everyone loves Blosom! Published by New York City-based Page Publishing, Patty Meads-Hanson’s exciting tale allows the reader to connect with Blosom, the world’s tallest cow. 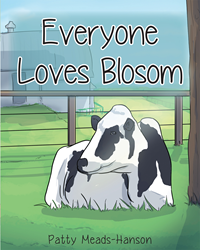 “Everyone Loves Blosom” is the true story of a very special cow. Blosom has loved people from the day she was born and makes everyone she meets happy. She serves as an example of the great things that can be achieved even if life doesn’t go as planned and to never give up. Her purpose as a milk cow wasn’t to be; however, she has taken on many other important jobs. Everyone that meets Blosom can’t help but smile. The entire world fell in love with Blosom when Guinness World Records awarded her the record of tallest cow in the world! Everyone Loves Blosom! Readers who wish to experience this moving work can purchase“Everyone Loves Blosom” at bookstores everywhere, or online at the Apple iTunes store, Amazon, Google Play or Barnes and Noble.